On this hot and humid night, defending Lucas Oil Bandolero Young Guns Champion Tyler Green started from the pole and looked like he might go wire-to-wire for the win. But a hard charging Brandon McReynolds looked pretty sporty in his number 8 ride, as he challenged Green for the lead all race long. The lone caution during the race, for the #12 car of Sam McAulay, set up what looked like may be an exciting restart between McReynolds and Green, but “Lil’ Mac” powered out to a quick three- to four-car length lead, even though he did encounter some lapped traffic near the end. McReynolds positioned himself well, setting up for the last lap as he put a lapped car between himself and Green. 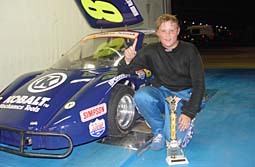 As for McReynolds, the 14-year-old driver from Mooresville, NC, the win was his second of the early season. 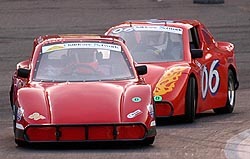 On the initial green flag, it didn’t take long for the hard racing to begin as it was three-wide into turn one with Artie Clever coming out with the lead and Chris Morgan and Duke Furr nose-to-tail behind him. Race Results: 1. Eric Redmond; 2. Bruce Benson II; 3. Ryan Salomon; 4. Chris Morgan; 5. Kara Clarke; 6. Artie Clever; 7. Randy Spencer; 8. Dawn Eagens; 9. Jennifer Spain; 10. Benny Mingo; 11. Jason Haynes; 12. Tim Keener; 13. Marcus Limehouse; 14. Ashleigh Wilkins; 15. Robin Metdepenningen; 16. Charles Long Jr.; 17. Derrick Long; 18. Duke Furr. Race Results: 1. Chase Pistone; 2. Chris Rogers; 3. Thomas Van Wingerden; 4. Matt Dibenedetto; 5. Mark Whitley; 6. Jesse Bunnell; 7. Derek Frohlich; 8. Tiffany Daniels; 9. Jeremy Kalina; 10. Ben Stancill; 11. Tonya Cordrey; 12. Ryan Ellis; 13. Josh Waring; 14. Todd Adams; 15. Louis Hawkins; 16. C.E. Falk III; 17. Tolliver Smith; 18. John Gottsacker; 19. Chris Eggleston; 20. Travis Pennington; 21. Tim Andrews; 22. Jeremy Colangelo; 23. 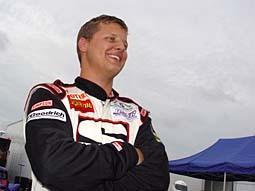 Michael Van Wingerden; 24. Scott Knox; 25. Jason Reisman; 26. Beau Slocumb; 27. Alex Haase; 28. Brent Seeley. .
Rogers summed up his race. “I lead about the whole thing, and the car was tight the whole race. Right at the end, we kept having cautions and Chase got around me. I could run right with him, I just couldn’t do nothing with him. Race Results: 1. Clay Hair; 2. Todd Johnson; 3. Brian Wiemer; 4. John Sossoman; 5. Tom Van Wingerden; 6. George "Cotton" Spry; 7. Jan Ingram; 8. Bobby Pence; 9. Phil Sharpe; 10. Eddie Harwell; 11. Chuck Dohm; 12. Dr. Mark Moskowitz; 13. Dennis White; 14. Chris Carlsen; 15. Bill Gardner; 16. Jeff Turner; 17. John Barilka; 18. Bill Mathers; 19. Tony Carper; 20. Terry Cochran; 21. Rick Little; 22. Randy Thornton. Clay Hair was the rabbit everybody would be chasing this night as he methodically worked his way from his ninth starting spot to take over the lead on lap 14 from leader Todd Johnson in the number 32 and never looked back. 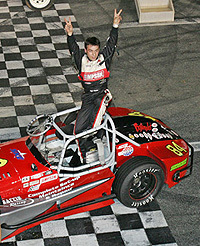 Hair, the 2004 Hardee’s Summer Shootout Series Legends Masters Champion, took the win in dominant fashion with a 10-car length advantage during the race. Johnson drove a good clean race. Chase Pistone charged hard from his 14th starting spot on the grid in the 28-car field. The 20 lap race which was caution filled, saw the 66 of Chris Rogers pull out to a commanding lead in the beginning, but Pistone would methodically work his ride into the lead on lap 17 around the pole sitter Rogers without any contact. 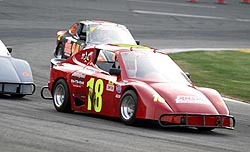 The Bandolero Bandits feature was a wild one from the start, with a multi-car pileup in turn two bringing the field to a halt under a red flag for over 10 minutes after one car got upside down in a multi-car accident. When the race got underway, the 14 of Derrick Ramey rocketed into the lead in turn one. Corey Gordon and Max Gresham were nose-to-tail for second and third, but it would be the 711 of Gresham who would quickly move to the front of the field. The driver from Georgia would hold the lead, but a fellow Georgia driver and friend, Austin Hill, would move to Gresham’s rear bumper with 12 laps remaining and put the pressure on through lapped traffic. 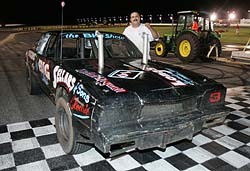 Hill would slip underneath in turn three to take the lead away and hold on for his first win of the season. Race Results: 1. Brandon McReynolds; 2. Tyler Green; 3. Cole Miktuk; 4. Josh Butler; 5. Matthew Stover; 6. Robbie Innella; 7. Mitchell Coble; 8. John Ellenburg; 9. Nick Hoffman; 10. Daniel Hemric; 11. Sloan Henderson; 12. Austin Dillon; 13. Trevor Farbo; 14. Amanda Harrell; 15. Rob Beasley; 16. Kendall Sellers; 17. Trevor Cauble; 18. Christopher Moore; 19. Jake Morris; 20. Ryan Rust; 21. John Stancill; 22. Bailey Freeman; 23. Kenny Brown; 24. Daniel Goins; 25. Bo Triplett; 26. Sam McAulay; 27. Jordan Coker; 28. Jordan Keaton. But coming from the 10th starting spot in the 18-car field was Girard, PA driver Eric Redmond to pull down win number three. “We started in back on the outside we had to fight the traffic, but we had no problem fighting through it,” said Redmond. Using the “choose rule,” Redmond ingeniously used it to his advantage to move up spot after spot. Taking the lead around lap six, Redmond never looked back. Bruce Benson II got around Ryan Salomon for the second spot and would finish in second and third respectively. Race Results: 1. Austin Hill; 2. Max Gresham; 3. Gerald White, Jr.; 4. Darrell Wallace, Jr.; 5. Nicholas Stroupe; 6. Derrick Ramey; 7. Clint King; 8. Corey Morrison; 9. Corey Gordon; 10. Landon Bullock; 11. Jordan Phillips; 12. Stephen Bergh, Jr.; 13. Matt Wallace; 14. William Nelson; 15. Tommy Hill; 16. Casey LaJoie; 17. Donovan Ponder; 18. Charlie Gresham; 19. Josh Williams; 20. Ryan Blaney; 21. Matthew Linker; 22. Dillon Bassett; 23. Noah Clark; 24. Ronnie Bassett, Jr.; 25. Meghan Dillner; 26. Jacob Harrell; 27. Dax Triplett; 28. Blake Eden. Kenneth Deese, driver of “The Big Show,” kept on rolling with his show right into victory lane again on Tuesday night in a race that saw a lot of bumpin’ and grindin’ going on. Race Results: 1. Ken Deese; 2. Gene Loden; 3. Rusty Drye; 4. Troy Van Allen; 5. Jerry White; 6. 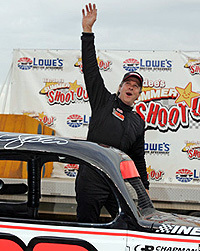 Jeff Blackwelder; 7. Dave Hutchinson; 8. Bob Dillner; 9. Tony Springer; 10. Walter Pecora; 11. Terry Plot; 12. Pete Kenney; 13. Randy Spivey; 14. Ashley Long; 15. Kristi Springer; 16. James Crider; 17. Dale Drye; 18. Larry Henderson; 19. Brian Spivey; 20. Matt Fernandez; 21. Casey Callaway. Early on, it looked like the Van Wingerden father, Tom, and son, Michael, would dominate the first and second spots for the night, but Kyle Beattie had something for both of them. Tom led the early laps as Michael and Beattie fought over second spot. But Beattie had more and showed his hand on lap 13 as he rolled to the lead over the elder Van Wingerden, leaving the family to settle the score for second and third spot. “Oh yeah, Michael was trying to pass me on the white flag lap and I told him your not going to pass your old man on the white flag lap,”said Tom. “I know how to block. I know how to do that, but he raced me good and clean. He was probably a little bit faster than I was, but for an old guy, that’s some good blocking. Race Results: 1. Kyle Beattie; 2. Tom Van Wingerden; 3. Michael Van Wingerden; 4. Chrissy Wallace; 5. Thomas Van Wingerden; 6. David Sugg; 7. Danny Keaton; 8. Adam Welch; 9. Hunt Dyer; 10. Scott Whitaker; 11. Terry Horak; 12. Timmy Andrews; 13. Jim Fluharty; 14. Jim Gresham; 15. Jon Michael; 16. Roger Simons; 17. Eric Harrington; 18. Buddy Compton; 19. Ashleigh Wilkins. “I was hoping on getting back to back wins again so that would help us move up in the points especially since the leader was the points leader.” said Brennan Poole of Woodlands, Texas. The Texan may be small in stature, but big on the throttle. Poole started ninth but worked his way towards the front to put himself into position for the lead which he would take away on lap 19 of the 20 lap feature and cruise to his second straight win. But the battle was over second and third at the line as Andrew Carlson and Casey Dohm took up the same piece of real estate coming off of turn four to the checkers and spun out of control and out of contention for second and third. Texas was represented well as all three of the top spots taken by the boys from the Lone Star state. Race: Results: 1. Brennan Poole; 2. Chris Buescher; 3. James Buescher; 4. Brandon Thomson; 5. Andrew Carlsen; 6. Kyle Fowler; 7. Casey Dohm; 8. D.J. Vanderlay; 9. Justin Morton; 10. Jordan Paschal; 11. Ryan Jernigan; 12. Steven Daniels; 13. Brandon Weber; 14. Chrissy Wallace; 15. Alan Hunter; 16. Trevor Bayne; 17. Kory Blevins; 18. Darin Coker; 19. Patrick McVay; 20. Keith Breasbois; 21. Trent Newton; 22. Collier Jones; 23. Jess Mattox; 24. Travis Beam; 25. Wesley Falk; 26. Paddy Rodenbeck; 27. Kory Abbot; 28. Matt Bowers.